Why is it that when I’m running or driving, with no way to carry a decent camera, is when I really want to take photos? At 7 this morning, Kyle and I headed south on Interstate 35 toward Faribault, to run in the Big Woods Run 10k race. We had fully expected the scenery on the way down, as well as during the race, to be stunning: it’s mid-October in Minnesota, we’re driving southward, and that park is full of old-growth deciduous trees. The color had to be amazing. What we didn’t count on was the enveloping fog that was present for a good part of the whole morning. We’d be talking about all sorts of things, then several times, either of us (ok, usually me) would interrupt the conversion to say WOULD YOU LOOK AT THAT??? I got no photos of the leaves, nor of the fog. But, as you can see, I did get photos of some of the most excellent bakery goods that the talented parishoners of St. John’s Church created for their bake sale, held post-race. I hope they made a killing. What a great idea, especially at a fall race, when it’s brisk outside. They should’ve had hot mulled cider for sale, as well! They did have apple jelly and apple butter for sale, but neither of us bought any because we each won a jar via the race-number raffle. What a day! Oh, the race. It, too, greatly contributed to the good morning. Tough! Like the Sound-to-Narrows that I ran in June, the entire first mile (and then some) was a long gentle downhill on blacktop. And, like during that race, I also got a nasty sidestitch because of it. Luckily via breathing exercises and willpower it went away by the time I entered the park. Within the Big Woods, the trail was mostly flat, sometimes rugged, always covered with wet leaves. It offered a few fine opportunities to turn an ankle but thankfully both of mine are made of rubber (rubber that will appreciate some ice, here, soon). It wound around in seeming circles, here and there joining with the half-marathon and 5k courses. The fog still lingered, with a stray leaf falling, now and then. I passed several people in the middle miles, though a few passed me (were they the same people? Maybe a few) during the last 1 mile stretch back up that blacktop. What a nasty last stretch it was! I don’t know if it was the pavement, or the headwind, or what, but it was pretty hard. Normally I eat up gentle uphills like that, but ooof, it was a challenge. Perhaps I was just spent! Some of my early mile splits were darn fast (hence the sideache in mile 1). I haven’t seen the official results, but I believe I finished in 52 minutes. A little over an eight and a half minute mile is pretty speedy for me, for a race that was 2/3 on trail. Kyle and I drove home, with our faith in rural Minnesota invigorated. Yay for the outdoors, and yay for church ladies. very nice job, arah! it was a beautiful race, indeed. score on the apple butter. I got a jar of the grape jelly – it wasn’t gelled. 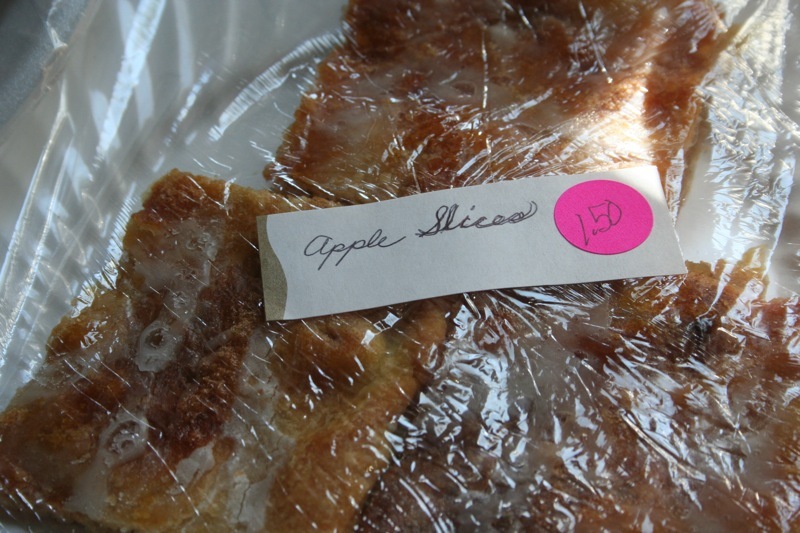 Hope yours had a little more pectin in it.Gotta love that race and its small town charm. Well, I’m glad I picked the apple butter, then. I had some on toast this morning. It was very tasty (and cinnamon-y)!